What’s your role at McKinsey and what kind of projects are you currently working on? I’m an Associate Partner at Digital & Analytics McKinsey, responsible for our Swiss Analytics hub. I serve retailers and industrials, both on analytics strategies as well as on the actual implementation of marketing-related analytics projects. 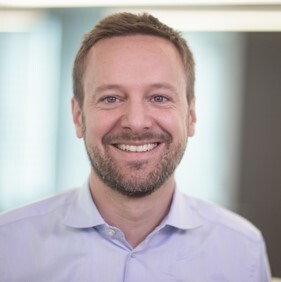 Before joining McKinsey, you were a post-doctoral researcher at ETH Zurich in the field of computer vision, involving mostly urban scene analysis. What motivated you to start a career in data analytics? I joined McKinsey to get closer to business problems than it was possible in research. It’s a fast-changing environment – projects typically last around 3-6 months – so you get to see a lot in a short time. Back when I joined, there was less focus on data analytics. This has changed in recent years and thus given me the ideal opportunity to combine my passion for data analytics with the business world. Andreas is an Associate Partner at Digital & Analytics McKinsey. He is responsible for the Swiss Analytics hub. He serves retailers and industrials, both on analytics strategies as well as on the actual implementation of marketing-related analytics projects. What excites you most about working with data? Finding new insights amid the wealth of previously unused data, ideally nicely packaged into a software app that our client can use going forward. Which skills would you regard as vital in your current role and which technologies do you primarily use? It is vital to be able to “translate” business problems into actual data science methodologies (i.e., what are we modeling, what input variables make sense from a business view? ), and translating them back again. One of the major challenges is making the end user understand and trust the data over their gut feeling and act on it. On the technical side, it is vital to understand statistics and machine learning methodologies, including when to apply them. Implementation happens mostly in R, Python, and SQL. How are projects usually structured? Do people work in a team in your company and what does the composition of an analytics/data science team look like? We have two archetypes of projects. On the one hand, they can be “standard” McKinsey studies on which analytics is used as a “next-level Excel” and we can derive strategic insights from a much larger data base. For example, this could be a churn reduction program for a TelCo, where an analytics consultant delivers the model to predict churn and the rest of the team derives potential marketing actions from it. On the other hand, we have analytics transformations where we help clients to build up their own analytic capabilities. In both cases, our analytics consultants work with the client on-site. How do you see the development of data science and analytics over the coming years? The demand for analytics has skyrocketed in recent years – driven by increasing data availability, access to it (e.g., connected machines), the better understanding of algorithms and top-management attention through impactful use cases. I’m confident demand will continue to grow. Personally, I see two challenges: a) onboarding business users to more analytics-based decision-making while making clear what to expect and what not, while also ensuring explainable models, b) ensuring IT departments can follow the rapid cycles and productize tools fast enough. Think business first. Understand what the business problem really needs in terms of technology. “AI” and “deep learning” are often not necessary. Know the methodologies. Understand methodologies and their respective advantages or shortcomings in statistical detail, so you’re in full control. Build testbeds. The larger the data, the more important it is to have standardized tests to understand and solve for potential structural issues early on. McKinsey and Company – Who are we?